Wax seals are much more than decorative accents for wedding or birthday invitations -- at least they were in the middle ages. Before that awful-tasting glue used on modern envelopes, candle-like sealing wax sticks were melted to the flap of an envelope and pressed with a custom wax seal to both reinforce the seal and identify who the sender was. Even before the introduction of the wax seal and the use of parchment paper, customized stamps were used all over the world in ancient civilizations. In Mesopotamia, impressionable stamps were used on clay tablets as a type of signature to authenticate the script. Once scroll paper, feather quill pens, and ink became more widely used, document and letter writing became more popular. It was then that custom wax seals became the preferred method of envelope sealing and authentication. At first, seals were strictly used by monarchs, bishops, and royal courts, but they eventually spread to the common people. During this time, the majority of people could neither read nor write, so these symbols became much more useful in distinguishing who the sender was than a signature or title would be. Individuals would have their own unique seals made from metal or stone and crafted into stamps or even rings. The seals intended to keep the contents of an envelope safe from prying eyes; if the seal was broken, the recipient would know someone was reading their mail. But the wax seal itself was significant. Custom wax seals often bore the initials or monogram of the sender. Sometimes, the seal depicted the sender's family crest or another recognizable image. The seal was applied as a form of validity. A butcher, for example, might have a cow on his seal, while a baker's seal may bear a bread design. Individuals would often have a monogram seal. Hundreds of years B.C., monograms were used as simple signatures to authenticate a document. Each initial of the individual's name of business would overlap. Traditionally, the initials of a person's first and middle names were located to either side of a larger letter -- the initial of the person's surname. 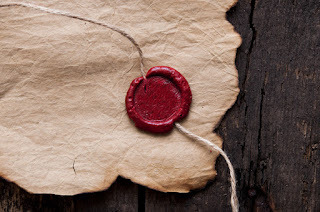 Sometimes the seal would be applied directly to the parchment, but in most cases it would be attached with ribbon or twine and hang as a pendant from the bottom of the document. Today, these seals provide a rustic touch to an otherwise average invitation or letter. Order your own custom seal through Nostalgic Impressions to make each of your letters a little more special and distinguished.